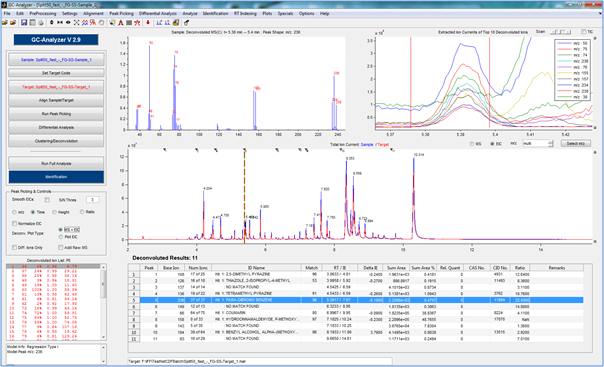 GC-Analyzer® is a software product to detect and identify all peaks from your GC/MS Data. The powerful Differential Analysis algorithm lets you detect minor differences between a sample and control for Trouble Shooting and Product Control. NIST MS Library search is used to automatically identify all detected components. GC-Analyzer can also be used for Deconvolution and reliable Identification of a single sample. Import Data from Agilent MSD, Agilent MassHunter, Thermo Xcalibur, the common NetCDF format or mzXML. AutoDeskew data files for scanning instruments. GC-Analyzer contains powerful deconvolution algorithms giving you very sensitive but accurate results for complex overlapping components. Quickly produce tables showing all identified components, retention times, intensities etc. GC-Analyzer will detect all your peaks using a single button press in less than 30 seconds. User tests have proven that no components will be missed. To detect small differences between two Samples (e.g. “Good versus Bad Quality”) use our powerful Differential Analysis algorithm. All ratios between sample and target components are calculated. Only keep components that differ between both samples using a specified ratio value. A unique feature from differential analysis is that you are able to detect very small unknown peaks exactly co-eluting with major peaks. The differential analysis procedure can also be used to correct for components present in your blank. Visualize your data using TICs, Mass Spectra, Extracted Ion Currents, Differential Dot Plots or 3-Dimensional graphs. Align Sample and Reference (Differential Analysis) using Peak Reference Warping Techniques. Use Retention Time Index Calibration to list detected components in RI values. GC-Analyzer is linked to NIST or Masslib Search to automatically identify all deconvoluted spectra. You will be able to change ID names or easily remove all peaks not matching specified criteria. Apply relative quantitation for all your components using internal or external standards. Apply Principal Component Analysis (PCA) to automatically double check all your peaks on Purity. Mixture peaks will be automatically flagged. Use Advanced MLR deconvolution techniques to Identify peaks consisting of two to four badly separated peaks. Directly submit results to NIST for Identification. Export Results to Excel or Text files. Easy saving of results. Extended user manual containing full documentation and examples.